Last friday’s optimism for a quick resolution to the potential fiscal cliff, continued this week as US equity markets rallied. In fact, US stock market indices had their best week since June. For the week the SPX/DOW were +3.5%, and the NDX/NAZ were +4.1%. Asian markets gained 1.7%, European market gained 4.9%, and the DJ World index rose 3.8%. On the economic front, reports swung back to positive after one week with a negative bias. For the week positive reports outnumbered negative ones five to three. On the downtick: building permits, consumer sentiment and the WLEI. On the uptick: existing homes sales, housing starts, the NAHB index, leading indicators, and weekly jobless claims improved. Next week we get to review the FED’s Beige book, Q3 GDP, PCE prices and additional housing reports. Best to your week! Probabilites continue to favor a continuing bull market verses a bear market rally: 70% to 30%. The recent downtrend did increase the probabilities of a bear market high at SPX 1475 to 30%, as noted last weekend. Yet, the market then held that friday SPX 1343 low, and then rallied to SPX 1409 in just a week. The rally was an impulsive five waves and it generated a WROC buy signal. These signals usually precede an uptrend confirmation, and historically are 96% accurate. As a result, probabilities are quite high the downtrend from SPX 1475/71 bottomed at SPX 1343. And, a new uptrend is underway. This week’s rally, however, does not remove the market’s bull/bear inflection point. After the SPX 1475 high the market did correct 8.9%. This is within the range of the first downtrend correction of the previous five bear markets: 6.9% to 13.8%. As noted last weekend, once the first downtrend ends the following uptrend can retrace from 69% to 90% of the previous decline. If we count SPX 1343 as the downtrend low, a bear market retracement rally would normally carry the SPX to between 1434 and 1462. Once this range is hit the bull/bear scenario will be defined by the market. If the market continues on to new highs - the bull market continues. If the market then rolls over into another downtrend – a bear market is probably underway. A simple hedge, once the market reaches this range, might be the best way to deal with it. But keep in mind the probabilities are 70% to 30% in favor of a bullish outcome. Our preferred count remains unchanged. A five Primary wave bull market that should conclude some time between mid-late 2013. 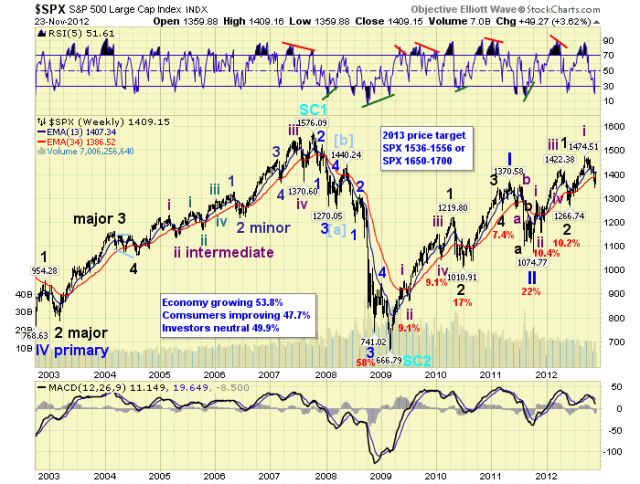 Primary waves I and II concluded in 2011 at SPX 1371 and 1075 respectively. Primary wave III has been underway since that low. Primary I divided into five Major waves with a subdividing Major wave 1. Primary III appears to be following a similar path, but Major wave 3 also appears to be subdividing into five Intermediate waves. Technically the RSI and MACD indicators still look bullish. After the SPX made a failed fifth wave high in October at SPX 1471, (DOW made a new high), the market headed into a downtrend. We labeled that high as Intermediate wave i of Major wave 3, with Int. wave ii underway. While the downtrend did take a while to get going, we counted the entire decline as a double zigzag. The first zigzag, Minor A, completed at SPX 1426. 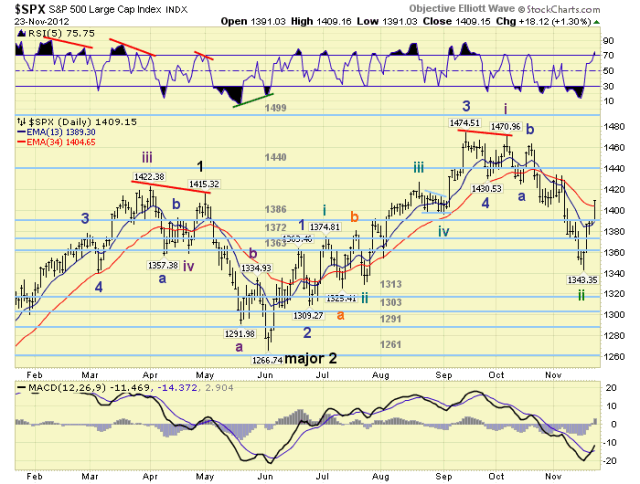 Then after a Minor B wave rally to SPX 1464, the next zigzag, Minor C, dropped to SPX 1343. At that low Intermediate wave ii had retraced 61.8% of Int. wave i, and Minor C was 2.618 times Minor A. When the downtrend began, the SPX 1345/46 area was calculated to be our worse case downtrend low scenario. At the lows the weekly and daily RSI’s were quite oversold. And, the hourly RSI was displaying a positive divergence, after hitting a quite oversold double bottom MACD. Normally, these are some of the type of technical requirements that start new uptrends. Since that low the market has spiked higher, hit slightly overbought on the daily RSI, and made a positive cross on the MACD after a steady decline. We have removed the downtrending label while we await an OEW uptrend confirmation. Under our preferred bullish scenario we will be counting this rally as Minor wave 1 of Intermediate wave iii. Medium term support is at the 1386 and 1372 pivots, with resistance at the 1440 and 1499 pivots. Short term support is at SPX 1403/02 and 1396/98, with resistance at SPX 1413/16 and 1422/27. Short term momentum ended the week extremely overbought – a pullback is now possible at any time. The short term OEW charts remain positive with the swing level now around SPX 1384. The recent action since last friday’s SPX 1343 low looks quite bullish. The market bounced sharply off that oversold low, as it has during some of the previous downtrends. The internal wave structure looks like a bullish five waves: 1361-1351-1390-1377-1409. And, we have observed multiple signals that a new uptrend is underway. Thus far, this advance looks similar to last November’s uptrend rally, and even June’s uptrend rally. In both instances the SPX rallied about 100 points before there was any sizeable pullback. Currently the market is extremely overbought short term. So some sort of pullback should be expected. 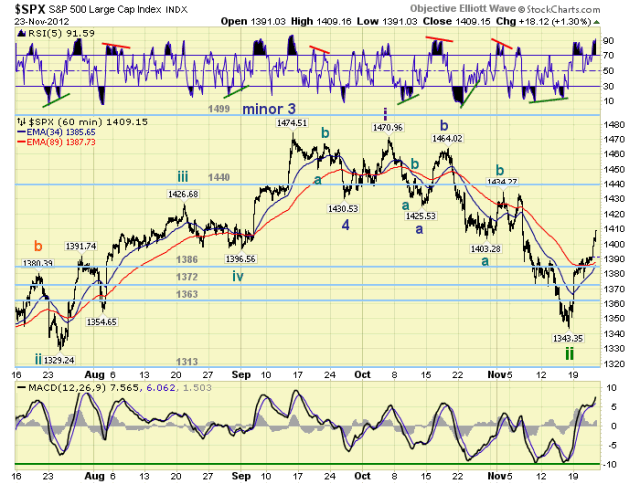 However, until a pullback declines below SPX 1390 we have to assume this rally, Minor wave 1, continues. Best to your trading! The Asian markets were mostly higher on the week gaining 1.7%. Hong Kong, Indonesia and Japan are in uptrends. The European markets were all higher on the week gaining 4.9%. Greece is still in an uptrend. The Commodity equity group were all higher as well gaining 3.7%. No confirmed uptrends here yet. The DJ World index gained 3.8% on the week, and has not confirmed an uptrend yet. Bonds are still in an uptrend but lost 0.7% on the week. Crude still appears to be trying to start an uptrend and gained 1.4% on the week. Gold looks to be starting an uptrend as well, gaining 2.2% on the week. The USD may have started a downtrend as it lost 1.3% on the week. A busy economic week ahead. On tuesday: Durable goods orders, Case-Shiller, Consumer confidence and the FHFA housing price index. Wednesday: New home sales and the FED’s Beige book. Thursday: weekly Jobless claims, Q3 GDP (est. +2.8%), and Pending home sales. Then on friday: Personal income/spending, PCE prices and the Chicago PMI. The FED has two speeches scheduled. Tuesday: FED chairman Bernanke at the FED in Wash, DC. Wednesday: FED governor Tarullo speaks at Yale in New Haven, CT. Best to your weekend and week.